I still have things to unpack that aren't quilt or yarn related, but I couldn't resist opening a few of the boxes in my sewing room. Here is the first UFO that I opened. This is the center and some of the blocks to the Kim McLean quilt Hearts and Flowers from the book Quilt Romance by Kaffe Fassett. Then I found this tin with the Primitive Gatherings tiny thimble template along with a lot of red and shirting thimbles already cut and a couple of pieces of fabric with tiny stars to make a flag. I need to count my baskets for the Trick or Treat basket quilt from When the Cold Wind Blows by Blackbird Designs. I started making these baskets in a reduced size and then switched to the larger size in the book. I think the ones in the book finish at 5". I think I've made some that will finish at 3". These blocks are from Holly and Mistletoe from When the Cold Wind Blows. That is one of my favorite quilt books. The center applique' wasn't in the box with the blocks and other fabrics. I won't panic just yet. I've missed my Kaffe and Brandon fabrics. This is my small container. I know there is more somewhere else. Lime, black and white. I have a plan for these fabrics. I'd forgotten about the Betty Boop fabric! I'll open a few more boxes tomorrow and show you what I find. A moving post? No, this isn't going to be an inspirational post. I've moved. No, not my blog, but our house. We have left the home we lived in for the past 25 years and have built a new one. We are still in Indianapolis, but we are now on the far southeast side of the city, almost to the next county. And, we love it here. This is my sewing room. Doesn't inspire a lot of creativity, does it? This is the corner where I have planned to put my sewing machine and table with my large cutting mat. This is what happens when you tell your helpers (my family), "Just put it anywhere." That is my TV stand in the left corner of the photo, and you can see the bottom corner of the white windowsill. I plan to face that window. Here I moved around with my back to the window and held the camera up overhead to take a photo. The boxes are stacked 3 high. The fabric is all the way in the back corner. Then at the end, they came in with my sewing table and the white table under the window with my big cutting mat. That was quite a trick and a lot of work to get it all switched around, but I have the table with the cutting mat back in the corner and the sewing machine table about where it goes. Most of my fabrics, books, rulers, tools, etc., have been in a storage unit for the past several months. I have been keeping busy with the projects you've seen on my blog: the 6 pointed stars, Patchwork of the Crosses, Road 66 hexagons, and Rotherfield Greys. In the photo below, I opened up a box of my quilt books. It's just like Christmas. You can see the edge of the bookshelf to the right. There is a long narrow closet, and I think I can put most a lot of my fabric in there. Thank you to my new followers and subscribers that have joined me. Also thanks to those of you who have emailed (Claire), called (Vicki) and sent photos of your quilt progress to keep me going (Rosemary) on my own projects. Thanks to all the bloggers that knew about my move and have written encouraging notes. Also, a special thank you to Staci over at the The Confused Quilter blog. Her husband is military, and I know they have moved several times. I wrote her begging for any advice that she could give me on how to organize things so my move wouldn't be total chaos. Because of her advice, I knew where at least 98% of my things were at all times. Whether or not I could reach them in the storage unit was another story. This moving is definitely not for wimps. I'm tired, but it's a good tired, and I should be ready to do this all over again in another 25 years. Now that I've shown you all of those boxes and piles, I'd like to take you along as I unpack. 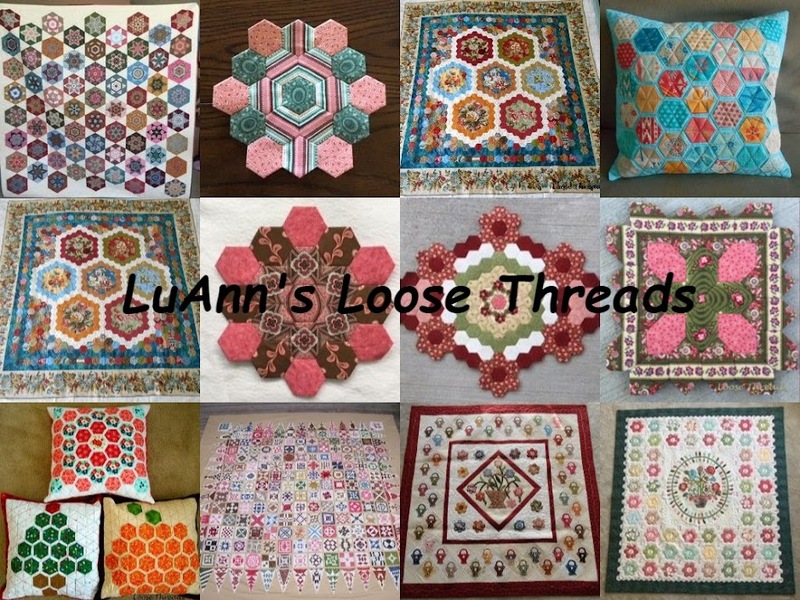 I have lots of UFOs, quilt tops that need to be quilted, and even some finished quilts. I also have to unpack my yarn. I haven't posted on my crochet blog since there was snow on the ground. I plan to unpack a couple of boxes a day and try to find a place for everything. I'll take some photos and show you what I find. If you are still reading, thank you. I usually try to keep the words to a minimum but wanted you to know what I've been doing with my time and that it may be awhile before I get things organized enough to sew too much. I appreciate each and every one of you that has stopped by my blog for a visit. A few weeks ago I received Rosemary Youngs new book, The Quilt Block Bible, in my mailbox. What a nice surprise! The book contains all kinds of blocks that can be used for any type of quilt. Here is Rosemary's quilt made from the blocks in the book. She has used reproduction fabrics, but the quilt would look just as great in bright fabrics. I love to study the fabrics in the blocks. There is a CD ROM included with the book with line drawings of each block. You can either use this to create your own templates or use the measurements to draw your own blocks in Electric Quilt. Can you see this block done in Kaffe Fassett fabrics? I really like the star fabric in the center of this one. The Quilt Block Bible is a great book and one that you should have on your shelf. Thank you Rosemary! I've made a few more six pointed stars. I'm making one a week (or sometimes six) along with Fussy Cut Fridays at Temecula Quilt Company blog. The two stars on the left and the top center star are made from Jelly Bean by Edyta Sitar. The bottom center is from Edyta's Hope Chest line. The photo below is mostly Jelly Bean with a couple of others that got mixed in. The blue star at the top right is Wildflowers by Jo Morton. The last star is Amelia by Jo Morton. My stars are 2" six pointed stars and are English Paper Pieced. I ordered my papers from paperpieces.com. I hope you are finding a bit of time to stitch today.